My time here in Sighisoara is coming to a close, and in four days, after a short visit in Bucharest, I will be flying home. The majority of my goodbye’s to friends and staff members were said last night when Veritas held its annual Candle Light Walk throughout the citadel. 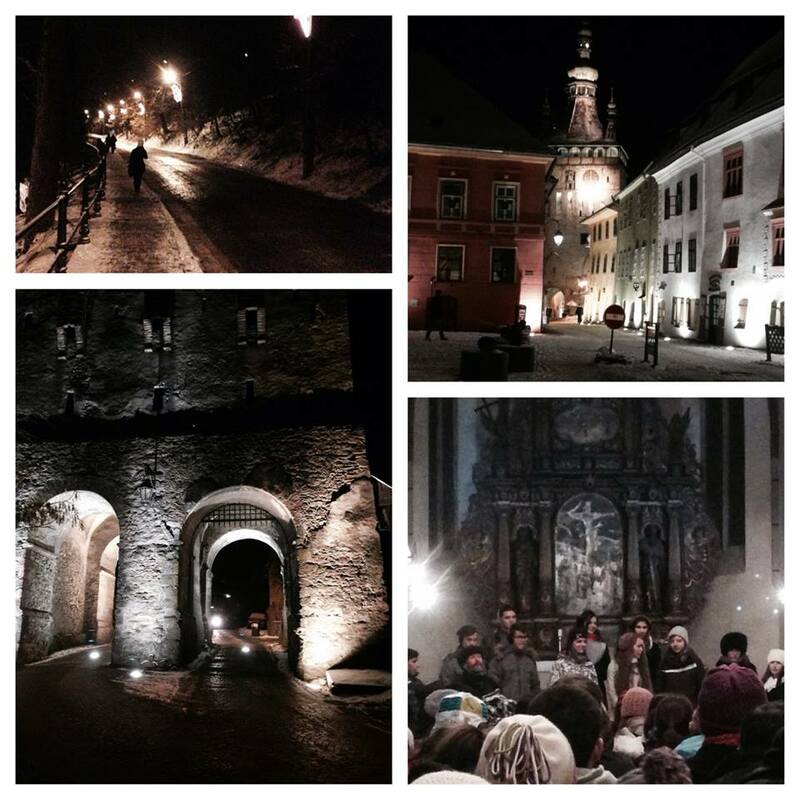 The Candle Light Walk is a Veritas foundation tradition where people of the city gather together to sing carols and pray for the city of Sighisoara. The evening began in the German church, where one of the RSP students led a children’s bell choir, a couple of songs were sung by the adult choir, and messages and prayers were spoken in four different languages by local pastors and influential townspeople. It was a beautiful time of thanksgiving, reflection, and preparation of hearts for the Christmas season. After the short service in the church, the group of candle-holders, led by a large star, walked to various different buildings and churches located in the citadel to sing and pray. Although it was freezing, it was a beautiful time of fellowship and prayer. After four or five stops were made, and prayers were spoken over the town hall, a local high school, and a couple of churches, we ended our night by drinking hot tea and eating cognac bread in the Veritas owned, House on the Rock and International Cafe. The building was packed, but we were thankful for the body heat! 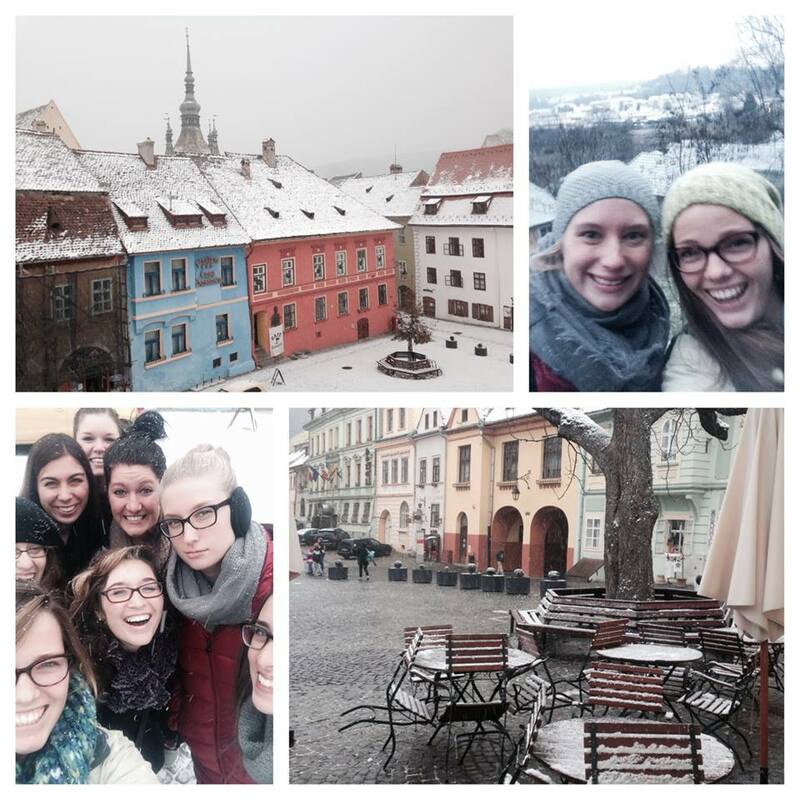 The snow has finally started to fall here in Sighisoara! And I love it! Unlike Holland, Michigan, Sighisoara is not a windy city, and this makes the 25 minute walk into town every morning enjoyable. It is cold, but the beautiful snow, to me, makes the cold worth it. I now find myself humming Christmas carols on my walks in between buildings and activities – ’tis the season! =) The city is somehow even more beautiful with the snow-covered houses and trees, and it makes me cheerful. However, the beauty of the snow does not cover the poverty that is now, even more so during the cold times, evident. This poverty is seen predominately among the Roma population, and it has been a struggle for me, this whole semester, of how I should respond or act towards this poverty.The contrast of beauty and pain here in Sighisoara is dramatic, and it has made it difficult to know how to cope. I am still learning more (I recommend reading “When Helping Hurts” by Steve Corbett and Brian Fikkert), but the one thing that I know for certain that I should and can do, is pray. God has shown himself faithful throughout my journey here, and one of the best things I can do for the people here is pray for them. Before, I simply saw the snow as part of God’s beautiful creation; now, I look and see the beauty of the snow as a reminder to pray for his people who are hurting, cold, and in need. 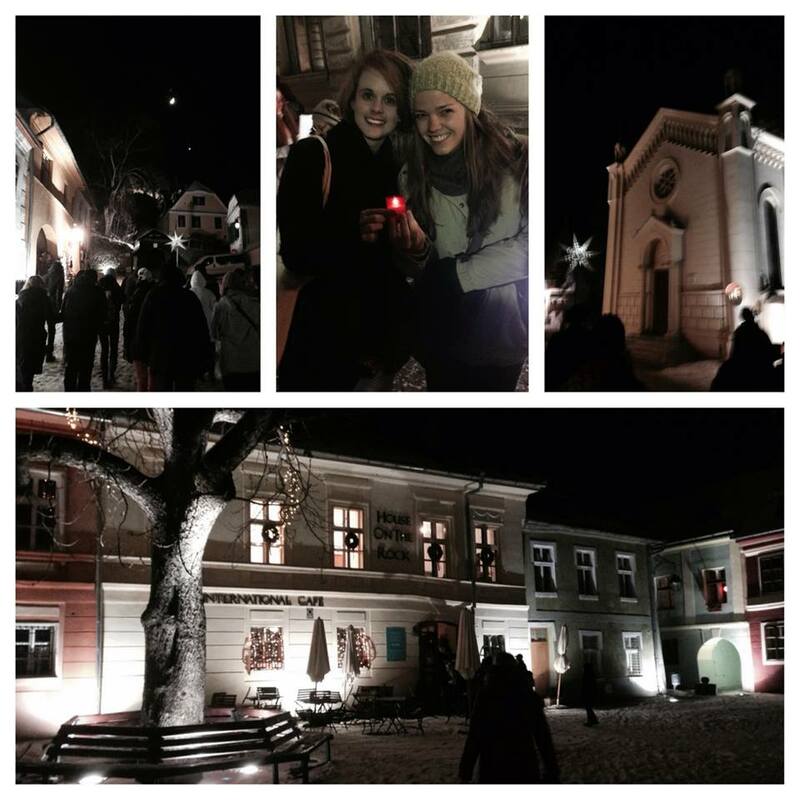 Thanksgiving weekend was a beautiful time here in Sighisoara. 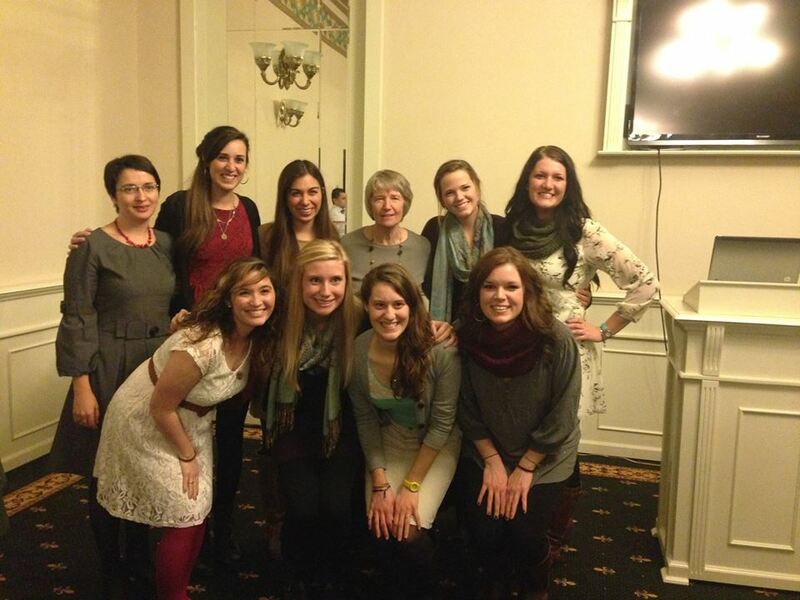 On Friday evening, Veritas hosted a Thanksgiving dinner for all of the RSP students, their host families, and the staff members that they worked with throughout the semester. It was a great opportunity for my host parents to meet my program supervisors, and for them to hear more about the programs that I was involved in all semester. The dinner this year was special because for the first time it was held at and catered by the four-star Central Park Hotel. The hotel owners have ties to Veritas, and they graciously offered their conference room for our special occasion. Events for the evening included a short video and a PowerPoint presentation on the American holiday tradition. For dinner, we enjoyed a creamy potato soup and type of coleslaw salad for starters, and then the traditional food was served – turkey, stuffing, cranberry sauce, green beans, and mashed potatoes! There was so much food, but it did not stop there. Pumpkin pie – my all-time favorite – was served for dessert! I was very pleased with the Thanksgiving meal, and thought that the chefs did an excellent job of preparing the dinner according to the “American Thanksgiving tradition”. 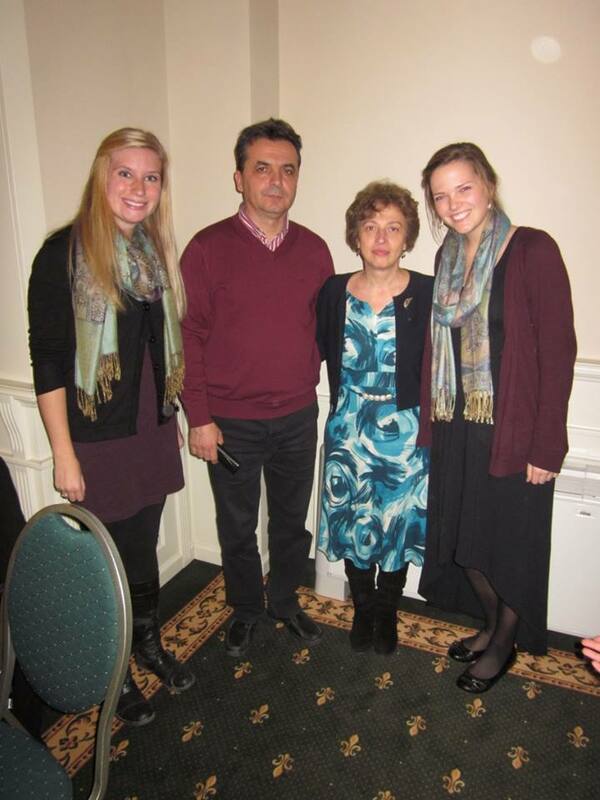 Jill and I with our host parents at the Thanksgiving dinner Friday night! After Carsten was done with class on Thursday, we borrowed his sister’s car and drove north to visit his grandparents who live just outside of Munich. 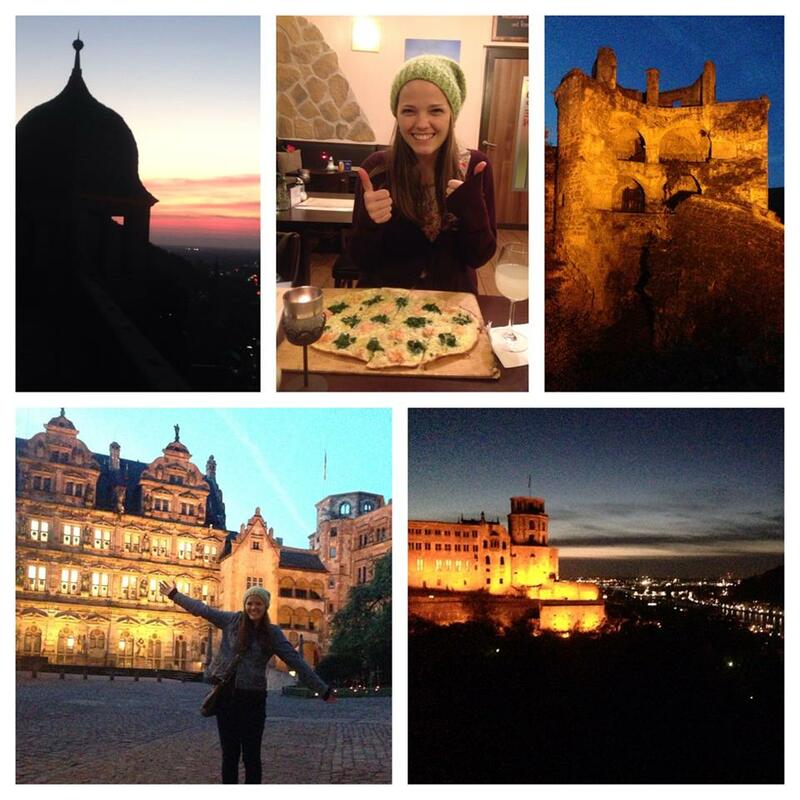 On the way up to their house, we stopped at Heidelberg to look at the castle and eat dinner. We arrived in Heidelberg somewhat later in the evening, and we ended up practically jogging through the city so that we could reach it to the castle before the sun set! We barely made it! The view from the castle was awesome, and I could not stop taking pictures. After touring the castle and its ruins, we walked back down to the town square to have a “traditional German” dinner before finishing our road-trip. The next day was one of my favorite days so far this semester. Carsten’s grandparents wanted to take us on a tour of the castles along the Rhine River. So in his grandparents’ car, we crossed over a bridge, drove up one side of the river, took a ferry back across to the other side, and drove back down along the other side. It was amazing! Every few minutes we could see ruins of a castle. There were so many, and they were fantastic! Along the way, Carsten’s grandparents would tell us (in German – Carsten translated) historical facts and legends about the castles on the Rhine. They were excellent tour-guides! His grandma loves to talk, and I was amazed with how much she knew about the Rhine. Carsten’s grandparents are two of the nicest people I have ever met, and they insisted on taking us out to lunch in a castle overlooking the Rhine. The food and view were incredible, and I was overwhelmed by their generosity. On our way back down the other side of the river, we stopped to walk through the woods to look at more historical monuments, and we also stopped for coffee and cake in a different city along the river. 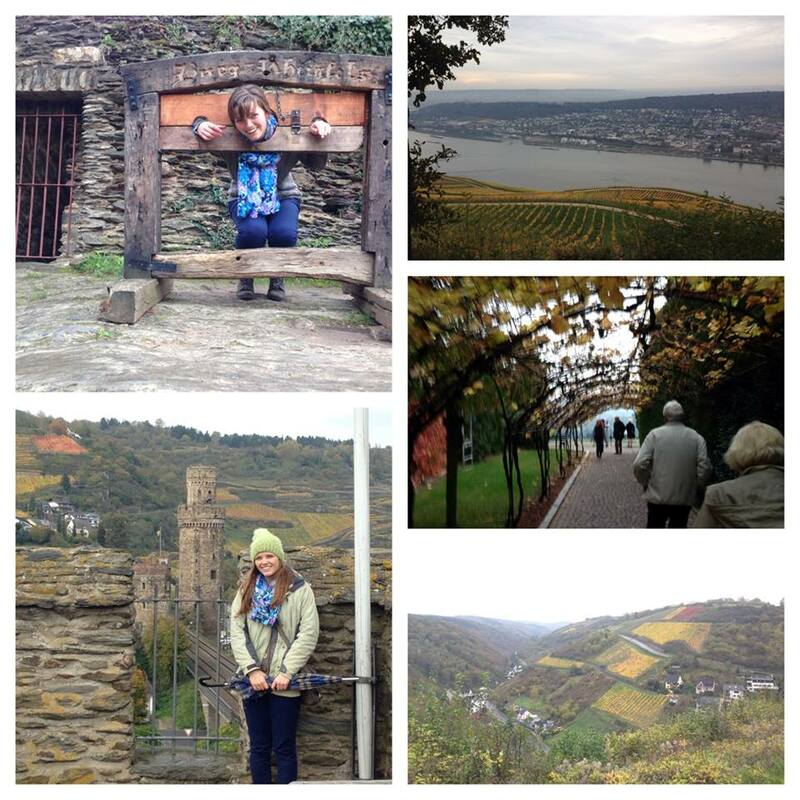 It had a terrific view of the Rhine and the surrounding vineyards! Have I mentioned before that I love vineyards?! Of course, I could not stop taking pictures. The day felt like I was living in a fairy-tale. I enjoyed every minute of the busy day, and am so thankful that Carsten’s grandparents wanted to take us on a tour of the Rhine. It was a fantastic weekend, and thinking back on it, I am still amazed how God blessed me throughout that trip. I am so thankful that I was given the opportunity to visit Germany for my week of vacation – it was an unbelievable experience!! 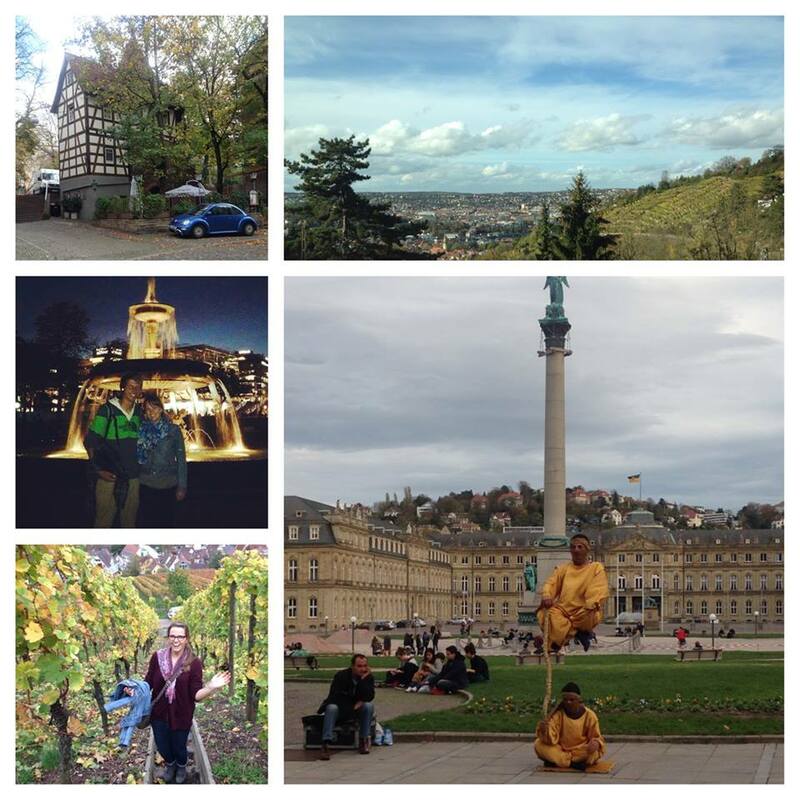 My first few days in Germany were spent in the city of Stuttgart. I loved the atmosphere of this city, and there was so much to do! During the mornings and afternoons while my friend, Carsten, was still in class, I spent the majority of my time just walking around the central downtown area, and admiring how the autumn colors enhanced the beauty of the historical buildings. Also, Doro, Carsten’s sister, took the time to show me around the city and take me to some of her favorite cafes. We went shopping together (which I normally do not like to do), but it was actually a lot of fun! The majority of our time was spent visiting sports-gear stores, bookstores, and shoe stores (which are my favorite stores to shop at). And I had a lot of fun helping her choose which snowboarding coat to buy. During the evenings, Carsten, Doro, and I would enjoy the city lights and night-life. And on the one afternoon that it rained, I was able to spend that time in the Stuttgart Art Museum! In my opinion, one of the best views of Stuttgart was from the Sepulchral Chapel on Württemberg Hill. 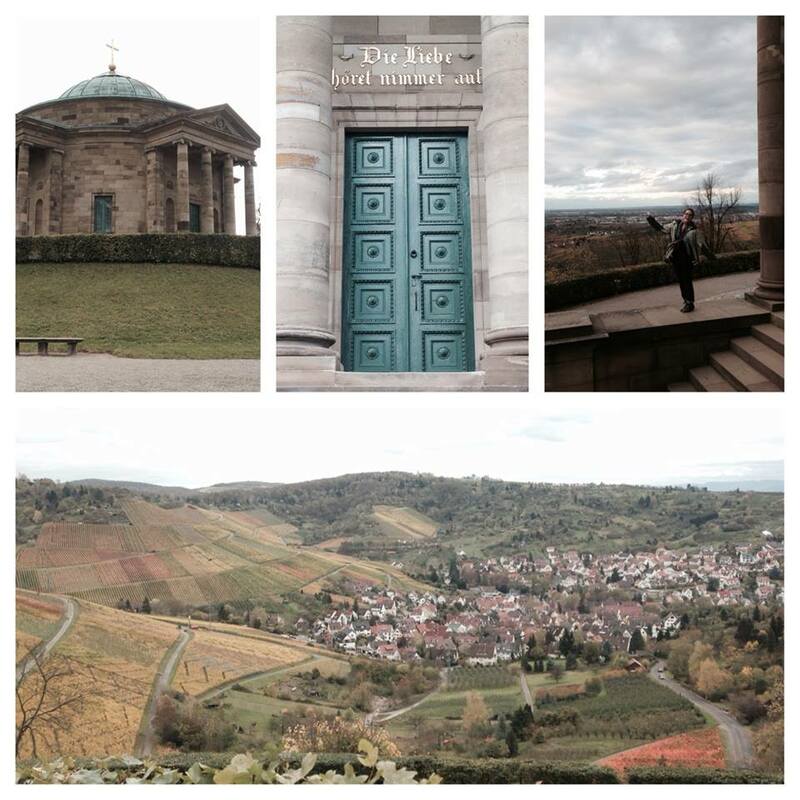 The chapel overlooks hills of vineyards, and the colorful autumn leaves were a perfect touch to the picturesque view. The climb up the hill was also a highlight. With permission from the grape harvesters, we walked straight up the hill through the vineyards, and were instructed to eat as many grapes as we desired! I love fresh grapes, and am convinced that one day I will have my own vines in my backyard. Stuttgart was fantastic, and I am so thankful that I had the opportunity to spend part of my vacation in this city! More to come on my German adventures! Sunday: My bus/shuttle left Sighisoara around 10:15 am, and I arrived at the Tg Mures airport in Romania around noon. There, I had a few hours to kill before my flight left at 2:50. While waiting for our flight, the woman next to me struck up a conversation with me. First, she tried speaking to me in German, next Romanian, haha and then realized English would be the way to go. She was extremely friendly and told me about her fiance in Germany, her sister in New York, and her children in Romania. She insisted that we sit next to each other on the plane, and laughed at me when I was searching for my seat number on my ticket (apparently there are not assigned seats with Wizz Air airlines). She was extremely helpful when we landed in Memmingen, Germany, and even waited for me while my motives for entering the country were questioned, just to make sure that I would know where to ask for information on where to wait for my reserved taxi. She was very thoughtful, and I appreciated her help. =) I had another hour and a half to wait in the airport before my shared-taxi arrived to take me to the train station. This was the part I was most nervous for about traveling alone – the train ride! Even though my friend, Carsten, had talked me through step by step what I needed to do, I was still nervous because I am not the best with directions, and this was my first time traveling by train in Europe! To my dismay, my first train was eleven minutes late, which only gave me one minute to catch my final train to Stuttgart. My anxiety was building with each passing minute — what happens if I miss my next train? it’s dark outside! I don’t speak or understand German! I will have less than one minute to get from platform one to platform four! which direction do I go after getting off of the train? I’m terrible with directions! — ha, these were just a few of the thoughts and questions that were racing through my mind. Yet, somehow, God kept reminding me to pray. Prayer for peace, safety, and direction. And God answered my prayer. =) A college-aged girl was sitting in the booth across the aisle from me on the train, and seemed to notice me frequently checking my watch and staring at my crumpled train ticket. I’m not even sure who spoke first, but somehow we found out that we had the same final destination. She checked an app on her phone and found out that we had missed our train, but that we could catch a slower train without having to pay an extra fee because it was not our fault for missing the fast train. She invited me to stick with her, and she even let me use her cell phone to call Carsten and let him know that I would arrive 40 minutes later than planned because I had missed the faster train. 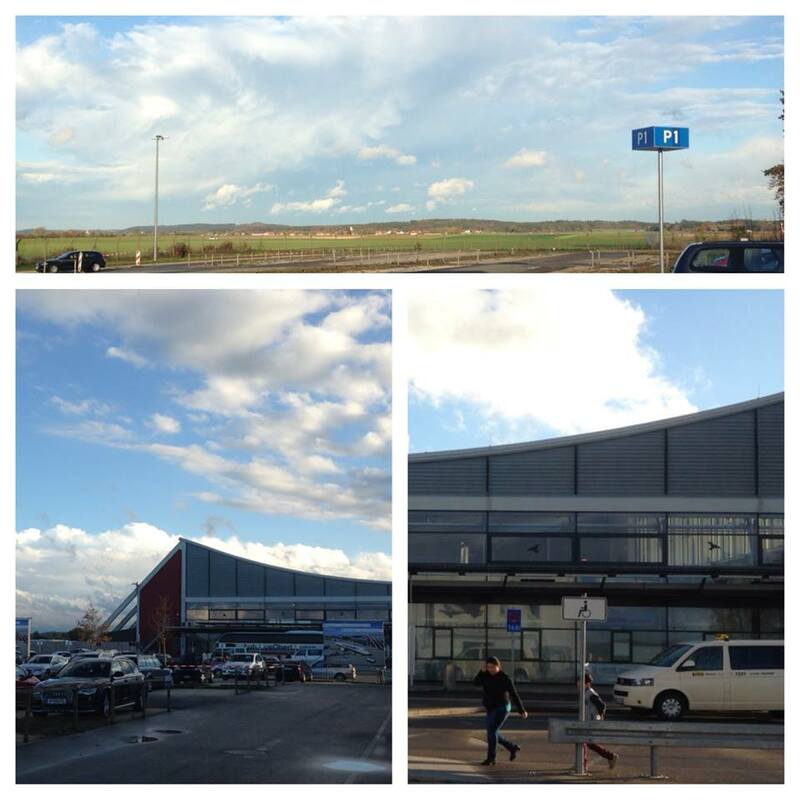 My first few pictures of Germany from the airport in Memmingen! I love the clouds. 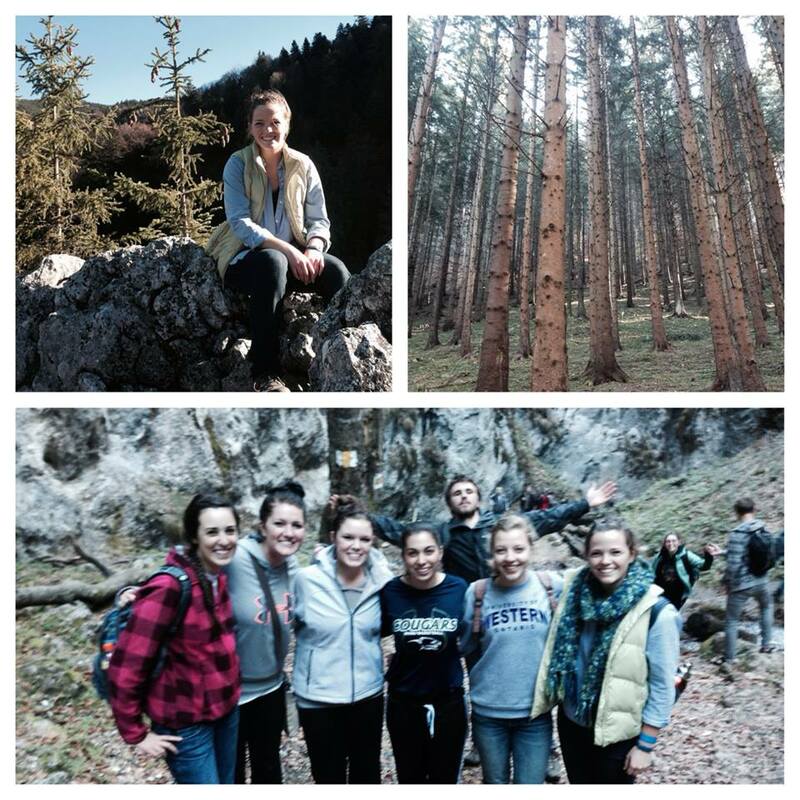 Stay tuned for more posts about my adventures in Germany! On Saturday, I had the opportunity to travel to Cluj with my host parents to visit and celebrate my host sister, Oana’s, birthday! 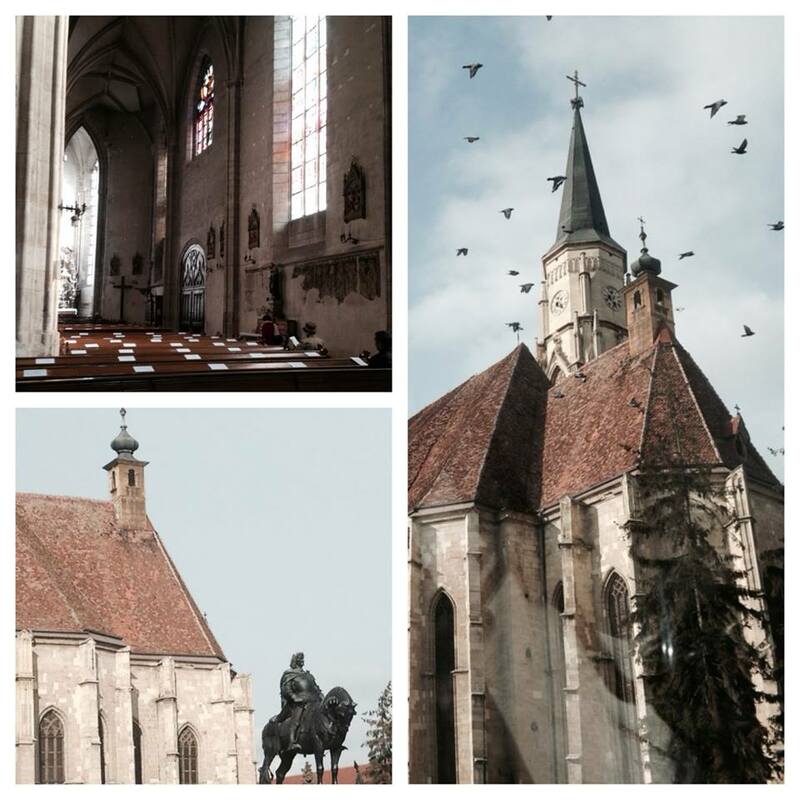 Cluj is a larger, more modern city about a two and a half car ride away from Sighisoara. The city is filled with numerous universities, including Oana’s school for fashion and design. It was exciting to visit the city and to see Oana’s apartment flat. My host family gave me small tour of the downtown area before we went out to eat for lunch at an elegant cafe. I ordered a traditional Romanian meal of a sweet basil soup for a starter, then mamaliga (polenta) with small pieces of chicken in a creamy sauce for my main course. My host parents are surprised at how much I actually do like mamaliga, because apparently the majority of their other American host students find it too boring and plain. I think it does have a simple taste, but I enjoy it, and I plan on making it on a regular basis when I get back to the States. My host mom has already given me the recipe (as well as many other Romanian dishes that I am excited to try to prepare for my American family). After enjoying each other’s company at the cafe for two and half hours, we toured the city some more and walked through the central park (which actually reminded me a bit of the pine grove back on Hope’s campus because the park was surrounded by university buildings and student apartments). We stopped at a vendor, where our host dad bought us roasted chestnuts to share. They were delicious, and for me, a unique snack. The sky was a bit gray, but it was a nice day to walk in the park. 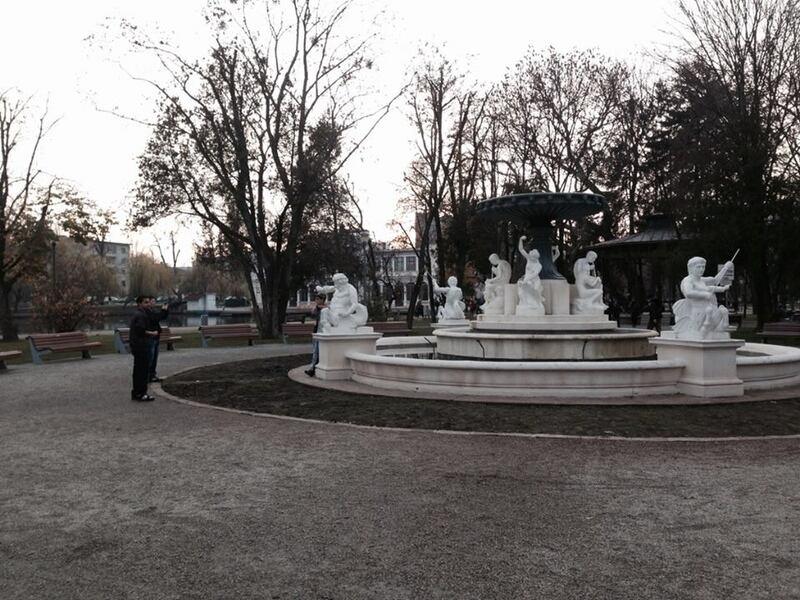 The town square in Cluj! If you look closely enough, you can see the beginning stages of people building an outdoor ice rink that is open for the public during the winter months. This, according to Oana, is a popular destination for the college students. 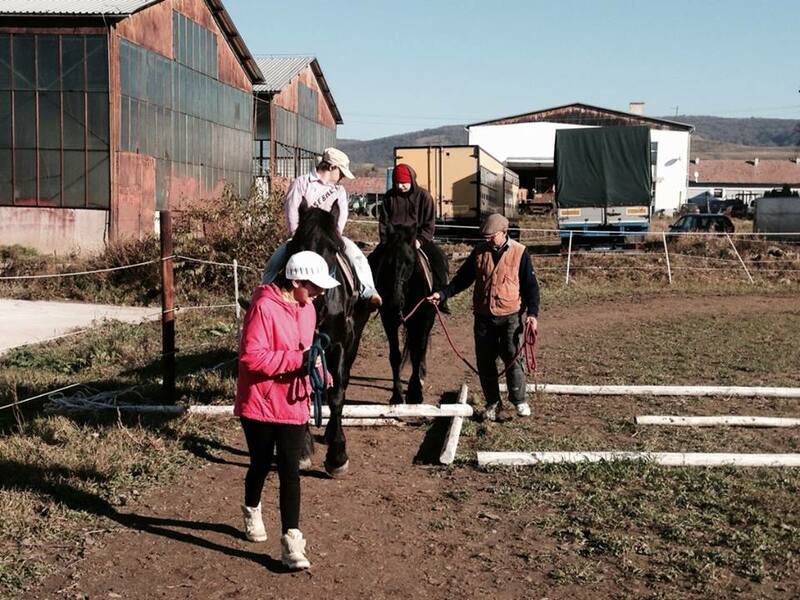 Yesterday, I had the opportunity to participate in horse therapy with a few members of Veritas’ Special Needs Club. Usually on Wednesday mornings I go with David and Mia (the Elderly Club supervisors) on elderly home visits, but there was an unexpected open seat in the van going to the horse ranch, and I was excited for the opportunity to experience something new. Plus, I love being outside and being around horses! Jill and I were the two students that joined the outing, and we had three club members participate that day. Gita, the club supervisor, helped lead the horses around the course while Maria, the horse ranch owner, led a few games and balancing exercises for the club members to participate in while riding the horses. Henny (in the pink) loved leading the horses just as much as riding! It was a beautiful morning for horse-back riding, and by all of the smiles I could tell that everyone thoroughly enjoyed their time with the horses. Jill and I were even able to ride for a few minutes – together!! Haha it was a lot of fun, and a unique experience because I had never ridden without a Western saddle before. 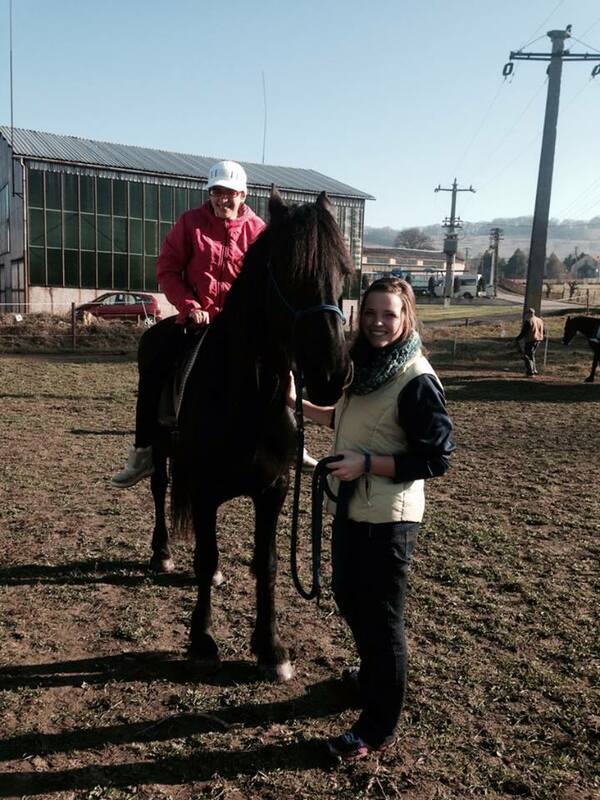 On the horse, we sat on a mat with a handle, but without stirrups! And I loved that! Jill and I both have experience with riding horses, and because we only live a few miles away from Maria’s ranch, she invited us to come back and ride whenever we wanted to. Jill and I are planning on taking her up on that offer this Saturday. 🙂 It was a fantastic morning, and I am grateful that I had the opportunity to participate! Perhaps I have a future in horse therapy?? Haha anything is possible. Scary and slippery ladders, but the climb was worth it! 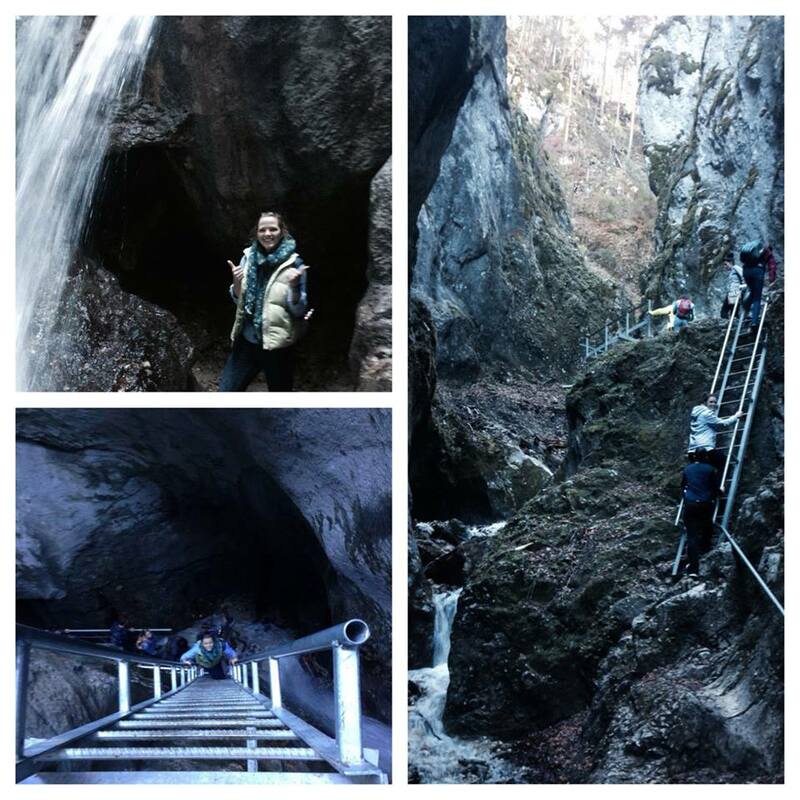 After climbing through the canyon and observing the waterfall, we hiked up and around the mountainside, exploring the beautiful scenery. Hikes here are my favorite, and I love being surrounded by God’s wonderful nature. After the hike, our group visited the downtown for a couple of hours. We grabbed a bite to eat, drank exceptional coffee, and toured the city by foot. A couple of our group members chose to take a gondola ride up to a high point on the hillside to overlook the city square, which I head was a great view, but I chose to explore the city and enjoy window-shopping with a couple of the other group members. 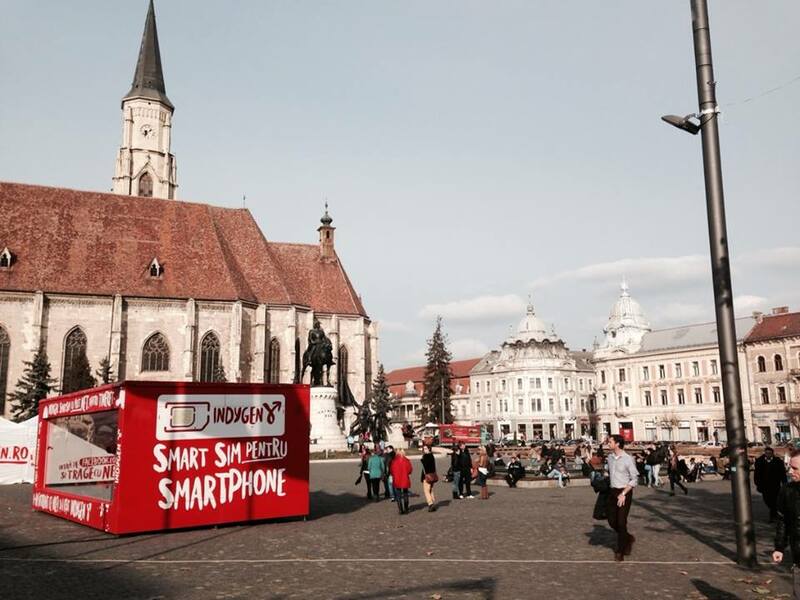 Downtown in the center of Brasov! Pictured on the top left is a glimpse of the coffee shop that we visited. Excellent coffee! Bottom left is a picture of the famous gothic Black Church, where we unfortunately were not able to view the inside. This church holds the largest church bells in Romania (which weigh roughly seven tons! ), and is one of the largest gothic churches in Eastern Europe. 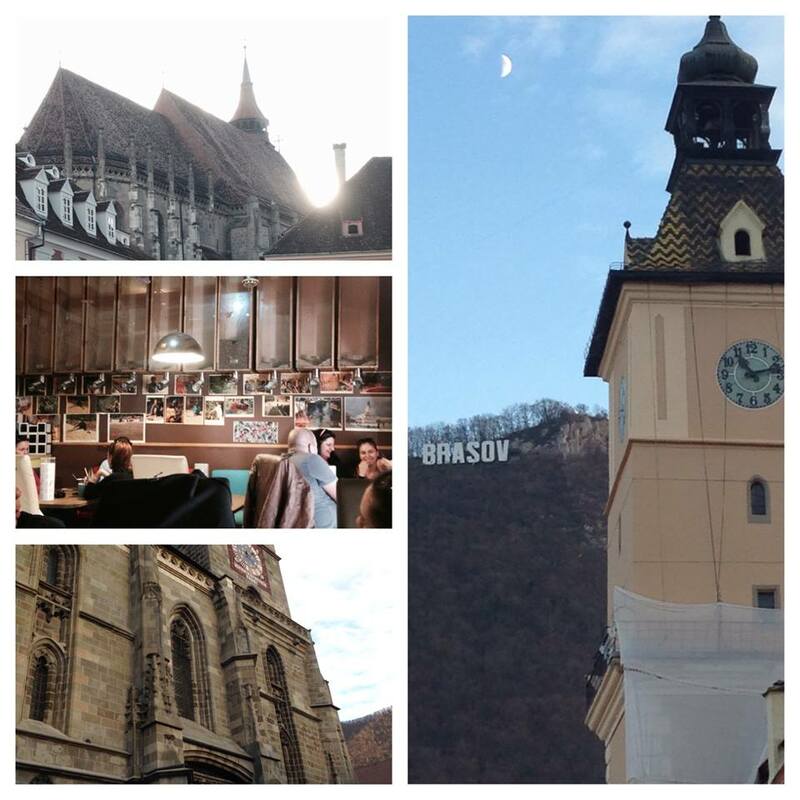 Posted on November 12, 2013 Author Marga GalensCategories TravelTags Europe, RomaniaLeave a comment on Day-trip to Brasov! 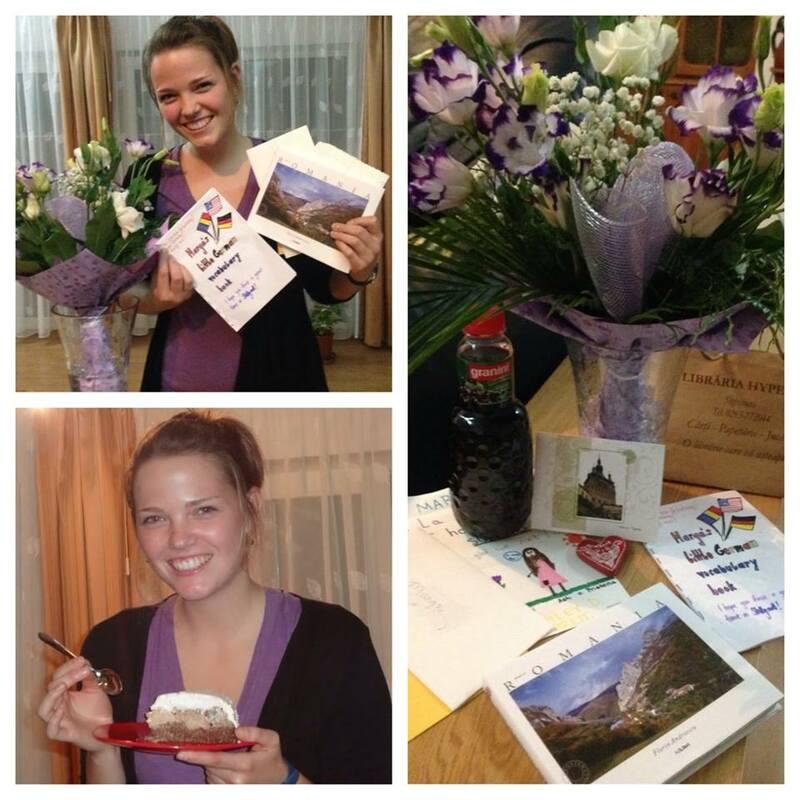 One of my favorite and most creative birthday gifts was from my German friend and Romanian language classmate, Ronia. Ronia made me a “Little German Vocabulary Book” to take with me and use while I travel to and spend my week of fall break visiting a friend in Stuttgart, Germany! I am actually leaving in half an hour to begin my journey to Stuttgart! I am incredibly excited for the week of break ahead of me, and I am thrilled that I have the opportunity to travel and see even more places in Europe! 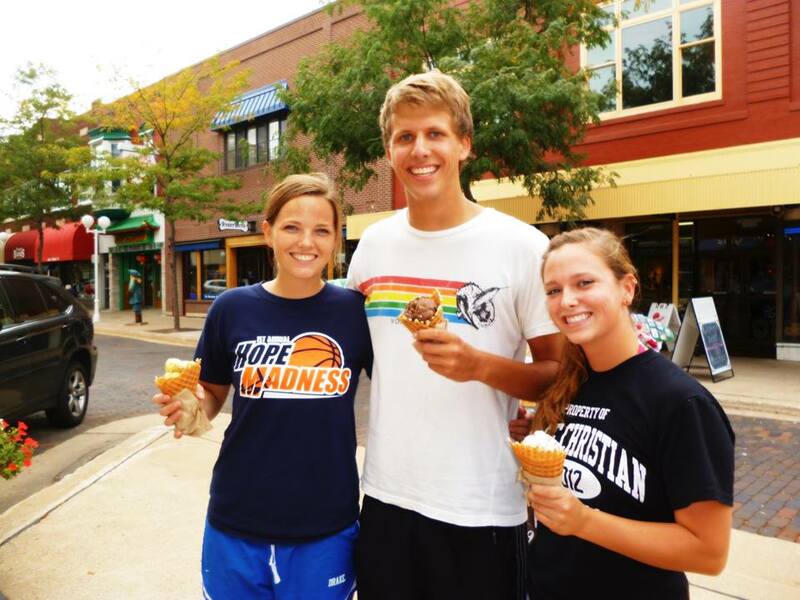 This picture was taken a couple of summers ago when Carsten (my German friend that I will be visiting this week) was in Michigan. Also pictured is one of my best friends, Andria. 🙂 I am so excited to see him again!!!! Lookout, Germany! Here I come! Posted on November 7, 2013 Author Marga GalensCategories Culture, Daily Life, TravelTags Europe, Germany, RomaniaLeave a comment on 22 and Fall Break! Proudly powered by WordPress Theme: Hope College Blogs, 2018 update.